While entries have closed for the 2017 Put Foot Rally (19 June to 6 July 2017), donors and fundraisers supported the Put Foot Foundation’s associated fundraising campaign and those of its entrants for months. The Put Foot Foundation was founded in 2012 by rugby legend Bob Skinstad and mates Daryn Hillhouse and Mike Sharman. It’s one of Southern Africa’s bright charity crowdfunding stars, with R3.2 million raised since 2012. The rally itself is an annual 8,000km trek across South Africa, Namibia, Zambia, Malawi and Mozambique. Anyone can join in, driving any car – and apparently, they can take any route. 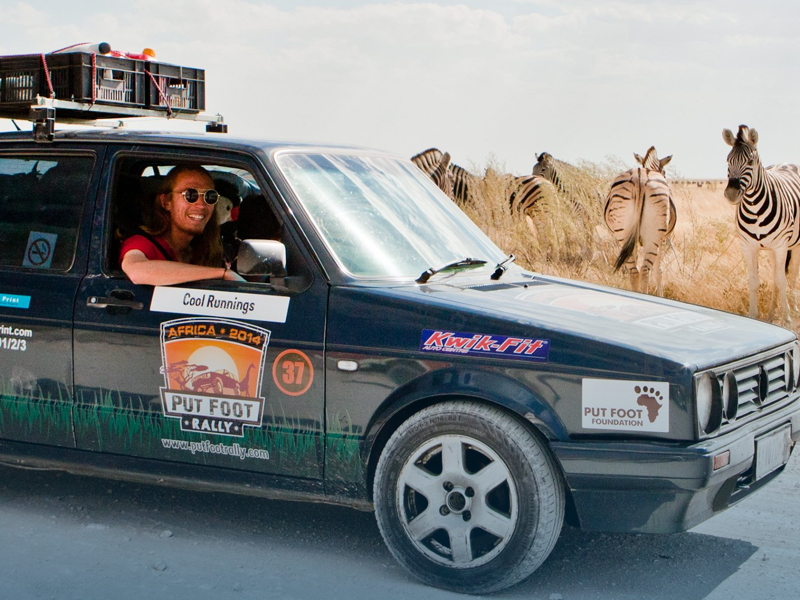 “With this rally, we want to prove that you don’t need a 4×4 to do African travel,” said Daryn on a call from Ohio, where the Foundation is currently expanding. How does fundraising around the rally work, and how can the public get involved? To qualify, entrants must raise a minimum of ZAR 750/USD 50 and keep raising funds while “putting foot” onto fuel pedals through the southern African hinterland in the milder months of the year. Drivers can run their online fundraising projects from their mobile phones, soliciting donations from their personal networks to support the Foundation’s work. Put Foot’s primary objective is to provide needy children en-route with South African-made shoes (16,800 pairs since 2012). This year Put Foot will introduce The Shoe That Grows, which comes with clips and buttons, so they can be extended as the wearer grows. “We’re aiming to raise at least $10,000 for the 2,000 pairs we want to donate in June,” Daryn says. The other aim is rhino conservation, another cause that is close to Africans’ hearts. Thus far, the Foundation has handed over more than ZAR 500,000 to charities involved in rhino conservation. Obviously, the objective is also to have as much fun as possible, says Daryn. But it can be a life-changing experience, he says – for the children as much as the drivers who physically put shoes onto their feet. Support hope, pride and dignity in Africa’s children! Donate to a GivenGain fundraising project for the Put Foot Rally or directly to the Put Foot Foundation.